Po Bronson and Ashley Merryman are the authors of the new book, Top Dog: The Science of Winning and Losing (Twelve/Hachette). Their previous book, NurtureShock: New Thinking About Children (also published by Twelve) was on the New York Times bestseller list for more than six months and an Amazon Top Nonfiction 100 book for over a year. NurtureShock was on over 35 "Year's Best" lists and is currently being translated in 16 languages. They have written cover stories for Newsweek and New York, as well as features for the New York Times Magazine, the Guardian, the Daily Beast, and others. 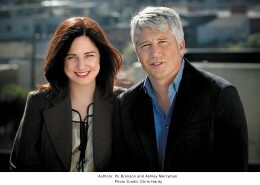 Reporting on the science of human development, Bronson and Merryman have won nine national awards for their writing including: the PEN Center USA Literary Award for Journalism; the American Association for the Advancement of Science (AAAS) Award for Science Journalism; an “Audie” from the Audio Publishers Association; and two Clarion Awards. Prior to their collaboration, Bronson authored five books, including What Should I Do with My Life?, a #1 New York Times bestseller with more than ten months on the list. Merryman's journalism has also appeared in Time, The Washington Post, and many other venues. Q: What’s the most significant risk you’ve taken professionally? she’d penned Slouching Towards Bethlehem for the Saturday Evening Post in 1967. I didn’t see the bubble coming, but I persuaded myself that the cultural impact of the dot com boom had peaked, and Silicon Valley would no longer be a cultural story, it was becoming only a business story. So, despite 101 offers of assignment, I turned them all down, and decided to do .... nothing. That was the hardest part of it. I didn’t have my next idea yet. I didn’t have another life raft to jump into. I did not harbor some other dream. I honestly had no hunch what was next. And it wasn’t like I could afford to sit around; my wife and I had just tapped our entire savings to buy a house. But I had to create room for the next idea to germinate. For about a year, I wondered what to do with my life before I recognized everyone was wondering what to do with their life, and that was my next idea – I would do a book about that question. Ashley: On the day-to-day, I think I'm risk averse. I'm pretty much a boring homebody: on most days, if I'm not working, I'm home reading a book, watching a crime drama on TV, or trying to learn to crochet. But career-wise, I've done a bunch of incredibly risky things. (e.g., I've hung out with Belfast paramilitaries.) I guess the craziest risk was when I decided I was going to leave a budding Hollywood career, drive across country, and go work for the Clinton-Gore 1992 presidential campaign in Little Rock, Arkansas. And just 24 hours later, my car was packed, and I was driving East. The thing is – at the time, other people thought it was a risk. For me, it just made sense. I didn't think of it as a risk or a potentially life-changing choice. Instead, it just seemed like an adventure, doing something that I'd believed in. And I think that's why I take those big risks. I'm not thinking of a long-term downside. I just think, "This makes sense. This is something I need to do for a while," and then I go for it. If I tried to think about risks and their long-term ramifications, then I, too, might have said, "This is crazy," and then I wouldn't have done it. But it's always the biggest risks I've taken that end up being the most worthwhile. Posted in one question Tags: Ashley Merryman, Joan Didion, NurtureShock, Po Bronson, Top Dog, What Should I Do With My Life?